With Brazil on the brink of recession, it's not hard to compare the country's looming financial collapse with that of Greece, as the country is following in Greece’s pre-crisis footsteps in quite a few ways. From openDemocracy. For a demonstration touted as an angry call for the Brazilian military to intervene in the country’s scandal-ridden political scene, the atmosphere in the streets was surprisingly sober, even indolent. And while the scorching Rio de Janeiro heat would probably keep any crowd from turning raucous, there is something else playing out in Brazil right now that added to the sceptical atmosphere. The message of Sunday’s demonstrations was more complicated than some fringe call for a return to the country’s dictatorial ways. Take a look at the three early twentysomethings in this photograph. 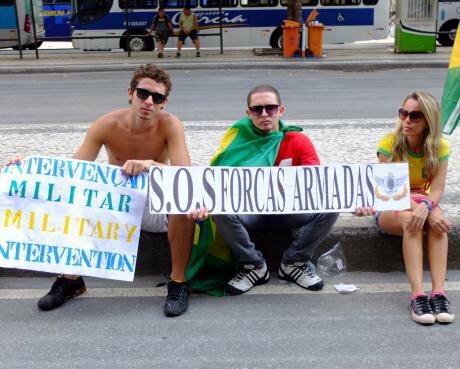 What struck me most in taking their picture was their attitude of near indifference – as if to say “we wouldn’t mind bringing back the military but, either way, we'll happily stroll down sun-soaked Ipanema beach”. It's an odd phenomenon, the nonchalant demonstrator. They may be disgruntled, but they're not exactly sure where to direct their anger (and by extension, they're not sure how to put it to good use, either). In this sense young Brazilians, far from nostalgic for a dictatorship they've never known, are much closer to the global crop of young citizens – kids who want to become political but would prefer to do so despite, against and beyond stock political allegiances. Unlike the 2013 demonstrators, many of those unaffiliated with Brazil's right-wing failed to respond to yesterday’s call to march. Still, these uncommitted young Brazilians saw the demonstrations as another sign of their country slip-sliding into an unknown future, one certain to feature an undefined, unpredictable, yet deeply radical change. Of course, with Brazil on the brink of recession it's not hard to compare the country's looming financial collapse with that of Greece; the country is following in Greece’s pre-crisis footsteps in quite a few ways: first, there's Brazil's notorious Petrobras oil scandal, much like Greece's own Siemens bribery scandal of a generation ago (its perpetrators still unpunished, by the way, after 17 years). Next, there's the fanfare of Brazil sponsoring the World Cup and the Summer Olympic Games, followed by the government's inept management of the required stadium and infrastructure improvements. Ditto Greece's sponsorship of – and feckless preparations for – the 2004 Summer Olympics. And finally, there's the inevitable disillusionment that follows when a government prioritizes a worldwide televised sporting event over the pressing social and economic needs of its people. This series of unfortunate events led to the financial meltdown in Greece, as it's doing now in Brazil. In Greece, a crisis of political legitimacy was followed by a financial one with the catastrophic consequences we all know about. From the rise of the far-right Golden Dawn party to the alarming growth in the suicide rate, too many people in Greece have persistently sought reassuring answers to the wrong questions. Meanwhile, the great economic forces at work in the country remain an intractable puzzle. For many of this angry global generation, the world's economists and financiers speak an incomprehensible argot – it's all Greek to them. This impenetrable confusion has led to a post-political rejection of conventional party labels. In Spain, for instance, it's seen the rise of the left-wing populist Podemos party and the near-simultaneous rise of Ciudadanos, its right-wing antidote. In Greece, it's seen the left-wing Syriza party come to power and, almost as quickly, be dismissed as “more of the same” in its struggles to confront Europe's unyielding demands for austerity. And so, we have reached a crucial moment. We're right in rejecting salvation from the usual political suspects; they've been tried, tested and failed. But unless we learn and share the lessons of our global crisis, unless we dissect and understand it as the inherently political and alarmingly commonplace process it has become, our twentysomethings might not mind even if it's tanks that take to the streets of Rio – as long as they remain out of sight from the beach.